Yesterday’s bombing at the Boston Marathon had repercussions throughout America, especially within running communities. 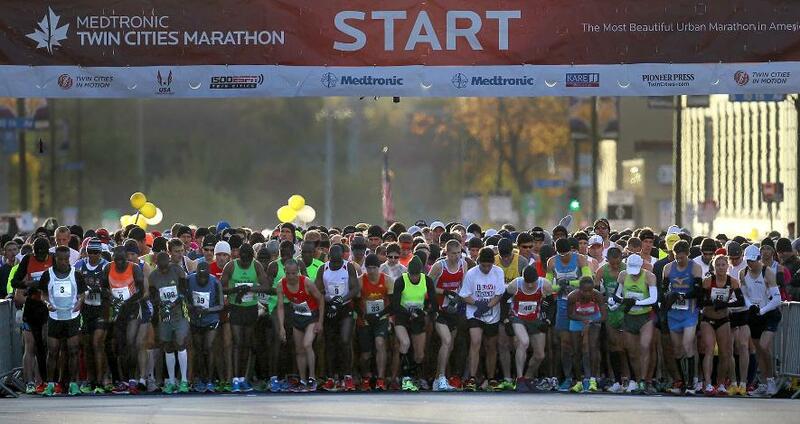 The Boston Marathon is the most prestigious marathon in our country. Many marathon runners yearn to run it; I have had it as a running goal for more than a decade. 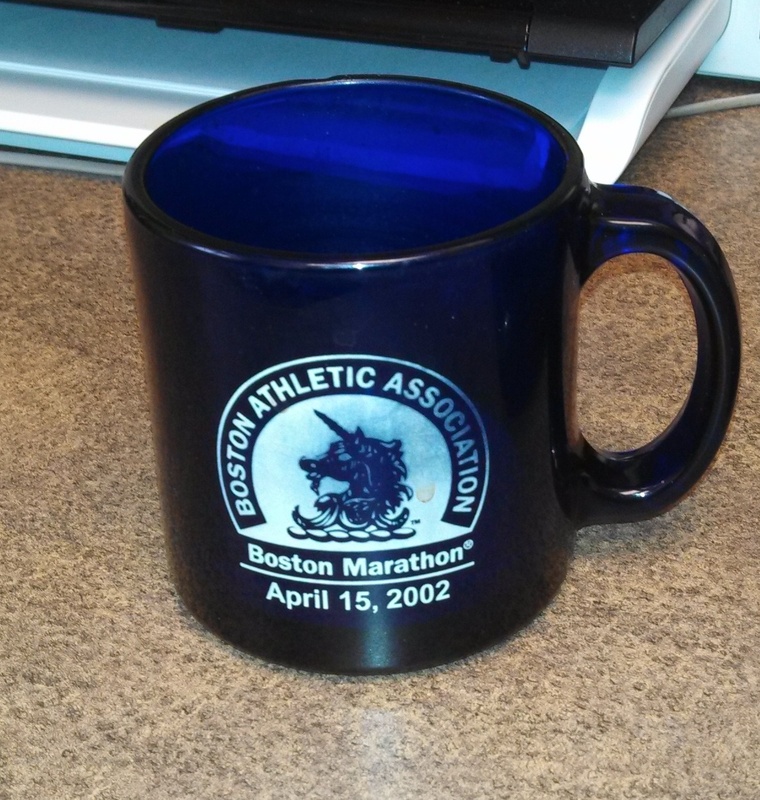 My office coffee cup is a gift from a running buddy who ran Boston eleven years ago. Last fall at Twin Cities Marathon, I was finally able to qualify for Boston in 2014. Yesterday I was tracking on-line my friends Mike Johnson and Dan Foster as they ran the marathon. (Runners carry a timing chip which charts their progress as they cross timing mats along the course.) Mike and Dan were moving along the course nicely. It was cool spring day, a good day for running. Dan finished the race in 3:28:57, a great time on a challenging course. Mike was further back; his training for the marathon had suffered from a variety of issues. I noted that he had complete 40K in 4:25:47 and was less than 2 miles from the finish. This was at 2:46 pm. I was about a half mile from the finish when everyone ahead of me was stopped. The spectators around us said they heard two explosions near the finish line area. I asked the spectator that first told us about the explosion if I could use his phone and I was able to connect with Zanny (his wife) right away. I am so glad I was able to do that so she wouldn’t worry. Later Mike was able to reconnect with Dan and both are now recovering: physically, emotionally and spiritually. Like so many in the world, Mike and Dan are praying for those victims who were injured or killed in this terrible event. Events like this show us the depth of human sin and wickedness and push us to reflect on life’s meaning. I remember writing to my running friends the day after the 9/11 attacks that I planned to run that day. On the day of the attacks I was too upset to run, but I decided that I could not let the terrorists “win a disruptive victory” and deny me the routine of solace and prayer. I ran that day praying for those who had died, praying for the responders and leaders, praying for our nation, and even praying for the terrorists who cause such evil. After all Jesus said, “Love your enemies and pray for those who persecute you” (Matthew 5:44). I plan a similar run today (though it will be more a walk due to my sprained ankle). I will reflect on ways that I can be God’s agent of peace, hope and love for the world. The tragedy of Boston places a media spotlight on the evil that human beings can cause (as well as the tremendous response of dedicated care from first responders). Yet this tragedy will not turn me away from the ultimate source of hope and renewal: Jesus Christ. His cross and resurrection is the paradigm through which I see all such tragedy. Even when humanity killed God’s Son, God brought new life: the resurrection. In the fall I plan to register for Boston, train and run it next April. I am confident that officials will find ways to improve security, though no one can make it absolutely safe. At the start the marathon will have a moment of silence to remember those killed and injured. Then the race will start and runners will do what they do: run. I plan to be one of them. 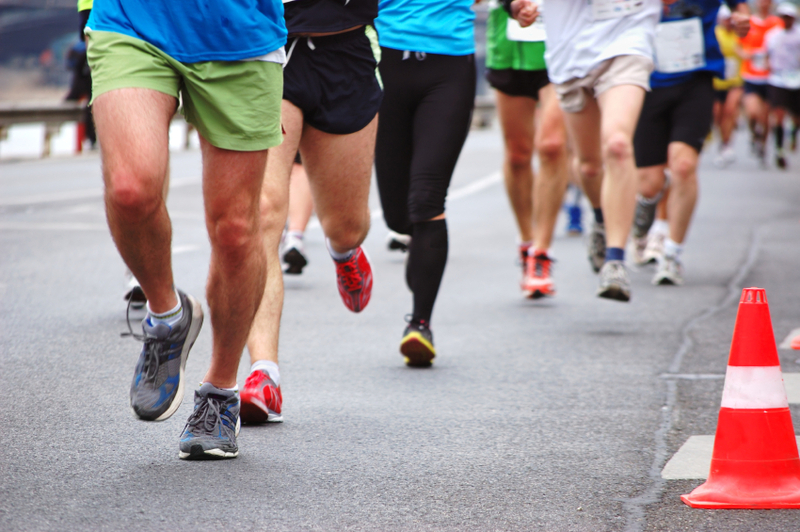 This entry was posted in Body Mind Spirit, Jesus, love, Running, Uncategorized and tagged Boston Marathon, marathon, Matthew 5:44, Twin Cities Marathon on April 16, 2013 by Pastor John Keller. What if the Marathon was in January? Many runners finish their first marathon and think, “Okay, I’ve done that. Don’t need to go through the pain, struggle and adversity again. Once is enough.” For me, the race had the opposite effect. I saw it as a great puzzle or challenge that I still have not figured out. Not that I think I will ever “solve” the marathon puzzle, but the combination of physical, mental and spiritual challenges continues to intrigue me. The challenge pushed me to run year round, even in Minnesota winters. Plus I still have that elusive goal of qualifying to run the Boston Marathon. This Sunday, I may be a bit cold when I approach the start line in Minneapolis, wearing shorts and t-shirt, hat and gloves. I will also have an old long-sleeve t-shirt that I will toss aside after warming up during the first couple of miles. After finishing ten marathons, I will know not to surge at mile 15, but wait for the real challenge at mile 21 and beyond. My marathon mantra, “The joy of the Lord is my strength” (Neh. 8:10) will be on my lips and the encouraging words of my friends and family will be in my ears. The chill of marathon morning will quickly pass as my body, mind and spirit rise to the challenge. The finish is only 26.2 miles away. Lord Jesus, let me meet the challenges of this day with your strength and joy. 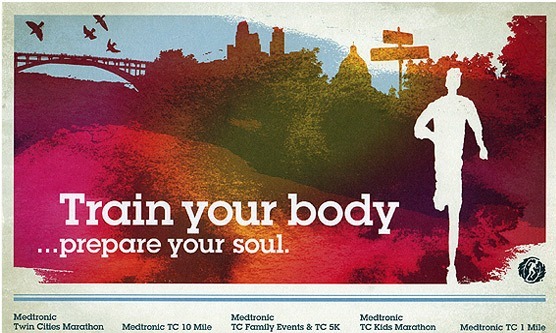 This entry was posted in Beginnings, Body Mind Spirit, Joy, mental exercise, Physical Exercise, Running, spiritual exercise, Uncategorized and tagged marathon, Twin Cities Marathon on October 5, 2012 by Pastor John Keller. In college, I ran track. 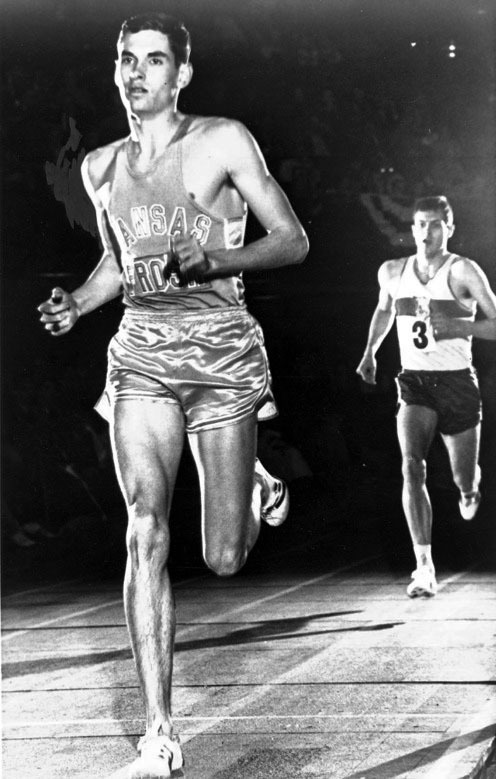 I was not very fast, but I grew up watching Jim Ryun run a sub-4 minute mile while in high school. I dreamed of being such a miler, clicking off each of the four laps on the track in 60 seconds. In reality, I rarely could run one lap under 70 seconds, let alone four in a row. Still I competed each year, yearning to improve. One thing track taught me was the value of persistence, especially in the middle laps. The first and last laps of a mile race have their own magic which can pull the runner along. The first lap has the quick start and the pack jockeying for position. The gun lap has the pull of the finish line and the knowledge that the race will soon be completed. It is the second and especially the third lap that always challenged me mentally and physically. The pain of running at race pace had become reality, but the finish seemed too far away to contemplate. If I focused on the pain, I rarely did well. If I focused on staying calm, relaxed, and fluid, I could maintain my semi-fast pace. By my senior year I knew the challenge I faced each time I approached the start line. I think of this as I prepare to run Twin Cities Marathon on October 7. My training is now in the middle laps; my last long run of 16 miles is still ten days away and I have a few more track sessions to complete. Nearly every day I am up early to run so as to beat the late summer heat. My mind and spirit has begun to tire from the long training cycle and many miles. Still I have been here before and I recognize that I must be patient and persevere. After my last long training run, I will begin a three-week taper of reduced miles so that my body can adequately rest and recover for the race. The Christian life also requires persistence and perseverance. The joy of the Lord is our strength (Nehemiah 8:10), yet not every day will be happy. Life can be difficult and challenging; it can feel like we are in the middle laps of a very long race. Our prayers may seem to circle around our heads, never reaching God’s heavenly ear. Saint Paul reminds us that we are to keep on praying, keep on believing and trusting, even when the days seem long. My fall marathon will soon come and then be over. Yet our life in Christ will carry on for many more laps. Christ is not simply at the start or the finish, but running beside us each lap of the race, helping us to stay patient and calm. Thanks be to God. Lord Jesus, open the eyes of my heart to see you each day. 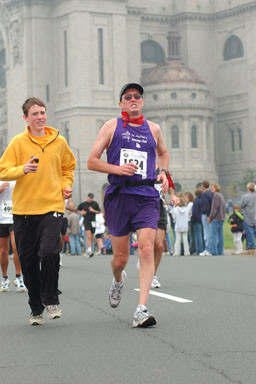 This entry was posted in Body Mind Spirit, mental exercise, Physical Exercise, Prayer, Running, Uncategorized and tagged marathon, track, Twin Cities Marathon on September 5, 2012 by Pastor John Keller.